Despite its low price, Ethereum Classic remains an important digital asset with a strong community. Ethereum Classic remains underpriced compared to the leading ETH asset, which has flown above $1,000. 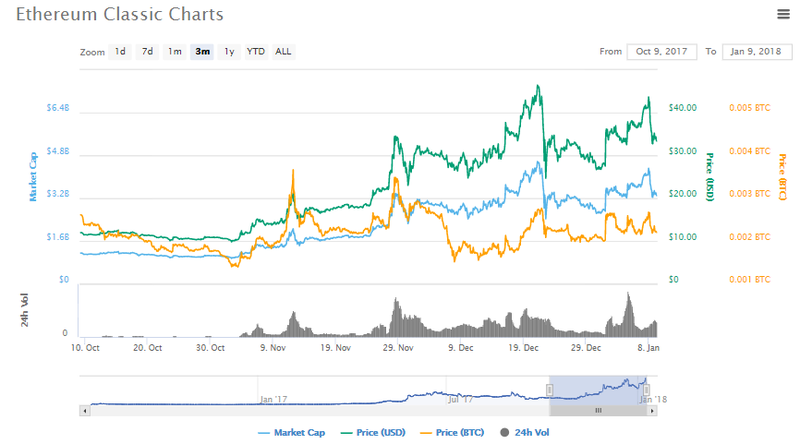 But ETC may still matter in 2018, both as a platform and a source of mining revenues. Right now, ETC does not look too good: its price has not recovered against Bitcoin, despite the nominal gains in dollar value. But there may be hidden upward potential in this coin, and perspectives for long-term growth. "The main accomplishment was that the team was established, that was a very challenging task, with very limited funding, under constant pressure from all sides and toxic environment, but by end of the year we grew up to 8 full time members in the ETCDEV team. The team got established development processes, working full time on core ETC projects, and will continue to grow." The ETC project has diffused the "difficulty time bomb" that it inherited from the Ethereum codebase. The blockchain, which contains the unaltered history of losses from the DAO hack, is taking on a different path, with an alternative policy of new coin creation. For 2018, the Ethereum Classic project has the main objective of scaling through side chains. Even at the moment, ETC is not as loaded by transactions as the Ethereum network. However, building a scaling solution in advance may be a benefit to the project. The other major area of development is an attempt to connect Ethereum Classic to the Internet of Things. The capability of working through many transactions would expand the usage of some cryptocurrencies beyond financial transactions. For now, the Internet of Things is only a concept, but at least it may lead to scalability and solutions for faster transactions. In addition, Ethereum Classic remains attractive for its mining revenues, and may be a coin to watch in the long run, as the rule of "miners follow the money" may apply.